Joyce Glasser reviews Central Intelligence (June 29, 2016) Cert. 12A, 107 min. On the evidence of Central Intelligence , Dwayne ‘the Rock’ Johnson, best known for his Fast & Furious films, is looking to follow Arnold Schwarzenegger’s dalliance with the buddy action-comedy genre when he was in his forties. On a rainy summer night there’s a lot of escapist fun here to distract you from the worthy messages about high school bullying, judging by appearances and dream fulfilling career changes designed to appeal to all ages. It’s just a shame that the talented Rawson Marshall Thurber’s (We’re the Millers, Dodgeball: An Underdog Story) high concept film lets cartoon violence and a hackneyed CIA plot get the better of the comedy. The poster for Ivan Reitman’s 1988 comedy Twins, pictured a 44-year-old, 5’0” 46’2” stout Danny Devito leaning on a muscle-bound, 41-year-old, 6’2” Arnold Schwarzenegger – his twin brother. 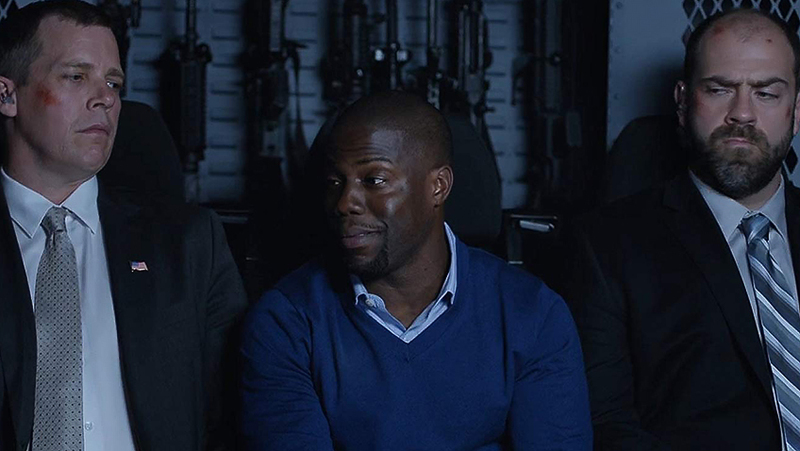 Older audiences are likely to remember this chalk and cheese buddy comedy about family ties and loyalty when considering the premise of Central Intelligence . 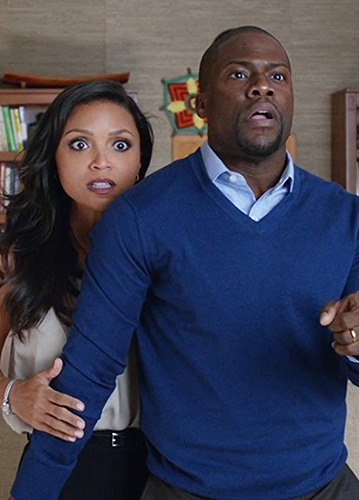 In Maryland’s (the film was shot in Boston) South Central High School (a play on words in the Central Intelligence title) Calvin Joyner (Kevin Hart) is The Golden Jet, a motorcycle-riding, cool dude who excels in sports and academics and is voted most likely to succeed. His graduation tribute is interrupted by a nasty prank perpetrated by bully Trevor (Dylan Boyack) on a fat, naked Robbie Weirdicht (Sione Kelepi). The joke is so cruel that it prompts the unhelpful school principal to comment, ‘there’s no coming back from that.’ Only Calvin helps the hapless Robbie by offering him his cool biker jacket to cover up his shame. Right on cue, Calvin is contacted by a mysterious Bob Stone who convinces him to meet him for a drink after work. In walks a guy who looks like a WWE champion but claims to be the bullied Robbie Weirdicht from High School. Of course, the joke is that Weirdicht is now Dwayne (‘the Rock’) Johnson, just as scheming Danny Di Vito’s twin brother turns out to be the naïve, honest country boy, Arnold Schwarzenegger in Twins. After watching Bob politely fend off adoring women, Calvin is speechless when Stone eliminates four tough looking thugs who threaten Calvin over a chair he wants to take from their table. Remembering the motorcycle he gave up for his new bourgeois lifestyle, Calvin readily accepts a spin on Bob’s impressive bike and they end up at Calvin’s (though where Maggie is, we don’t know). Here Bob asks Calvin’s help in interpreting some data that looks suspiciously like U.S. satellite encryption codes. It’s not until the next morning when the CIA, led by Agent Pam Harris (Amy Ryan) break into Hart’s home looking for a rogue CIA agent that Calvin starts to suspect he’s been manipulated and used. Bob Stone, Harris tells him, is the Black Badger, a terrorist who stole government property and killed his partner, Phil (Aaron Paul from Breaking Bad). She pressures Calvin into betraying the elusive Bob, although Calvin denies that Bob is his friend at all. When they next meet up, Bob tells Calvin that the Black Badger killed his partner, Phil and he is clearing his name by trying to discover who stole the codes. Calvin has to decide who to believe and whether he’s ‘in’ on Bob’s plan. It is fittingly a visit to the office of high school bully Trevor (Jason Bateman), now a successful banker, which finally convinces Calvin what path to follow. In this manner Calvin also gets back in touch with the Golden Jet inside him that had gone into storage and was waiting to be unlocked. The chemistry might not match that of ‘Twins’, but Johnson and Hart play off one another very well. Mercifully, Hart has toned down his shrill, annoying voice to make his role as an accountant, married to a serious lawyer, more credible. There is still, however, too much emphasis on Hart’s trademark verbal diarrhoea, and repetitive hysterical reactions of fear and denial, first to Bob and then to Harris, for his quota of humour. While there are more good laughs and less toilet humour than in the recent ‘Boss’ the film is less classy than ‘Nice Guys’. It seems like Thurber and co-writers Ike Barinholtz and David Stassen couldn’t make their minds up whether they wanted an action movie or a buddy comedy. The result is that there are too many scenes of cartoon violence (a bloodless shoot out for instance), coupled with another hackneyed rogue agent plot when what is needed are more great character and situation-based jokes.